Stress echocardiography is a common diagnostic procedure used in the evaluation of coronary artery disease. 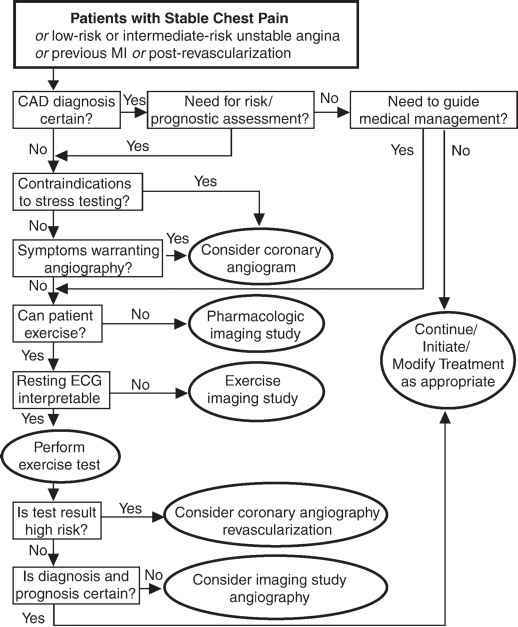 In fact, stress echocardiography is now a widely accepted test utilized for the diagnosis, prognostication, and risk stratification of ischemic heart disease (Fig. 1). Imaging is most often coupled with treadmill stress, however, it can be easily coupled with pharmacological stress, bicycle exercise, or pacing. In skilled hands, stress echocardiography is safe, versatile, and accurate, providing important information on segmental wall motion and overall ventricular function. The interpretation of echocardiography images is based on changes in regional myocardial thickening with stress. In the setting of significant coronary artery disease, regional myocardial thickening will decrease as a result of oxygen supply-demand mismatch. The area supplied by the stenosed coronary artery will, therefore, display a change in contraction, enabling the identification and extent of underlying coronary ischemic disease. In the absence of hemodynamically significant coronary stenoses, an increase in systolic wall thickening should be observed in all coronary territories with a decrease in the size of the left ventricular cavity. 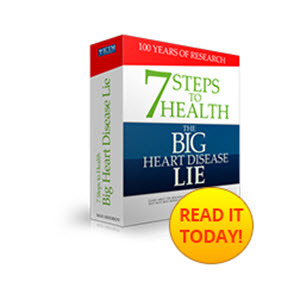 Therefore, localization and burden of ischemic heart disease can be routinely assessed. when no wall motion abnormalities can be induced with adequate stress, surgery can usually be performed at relatively low risk for perioperative events. Stress echocardiography can be used for prognostic purposes in those with chronic coronary artery disease and in post-myocardial infarction. As in risk stratification, the extent and severity of ischemia as evidenced by inducible wall motion abnormalities is a main determinant of prognosis, as well as overall left ventricular function. Among individuals with known or suspected coronary disease, a normal stress echocardiogram portends a more benign prognosis compared to those with abnormal stress echocardiography results. In addition, the presence of viability with dobutamine echocardiog-raphy (biphasic response) in those with coronary artery disease can identify those in whom revascularization and functional recovery is more likely (see Chapter 5, Fig. 17). Fig. 2. 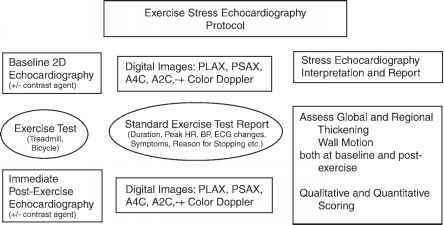 Exercise stress echocardiography protocol. with small, calculated aortic valve areas, low ejection fractions, and low transaortic gradients, stress echocar-diography can be used to increase cardiac output and further define the severity of aortic stenosis by calculating changes in aortic valve area with stress. In a similar fashion, mitral stenosis can be evaluated and pulmonary systolic pressures calculated after or at peak stress. Therefore, in situations where the severity of stenotic valve lesions is questioned, stress echocar-diography may provide important information to guide management decisions. Standardized images are acquired before the initiation of exercise and immediately after exercise. Two paraster-nal views (parasternal long axis and parasternal short axis) and two apical views (apical four-chamber and apical two-chamber) are used to assess endocardial wall motion (Fig. 3; please see companion DVD for corresponding video). A common practice is to hold atrioven-tricular nodal blocking agents prior to testing, as the attainment of at least 85% of predicted maximal heart rate is desirable. 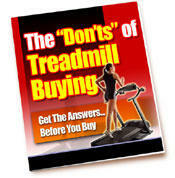 It is important that the acquisition of images occurs immediately postexercise when using the treadmill machine. If images are acquired late after exercise, the heart rate may decrease substantially, giving time for any peak wall motion abnormalities to subside and, therefore, go undetected. The use of a supine bicycle machine may improve the timing of image acquisition, as images can be acquired at almost any time point during exercise and give true peak stress imaging. It is, therefore, believed that supine bicycle imaging may improve the sensitivity of testing over treadmill exercise. Fig. 4. 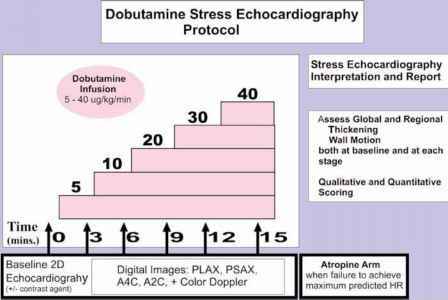 Dobutamine stress echocardiography protocol. 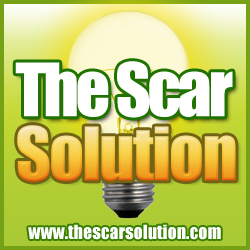 levels is an important component in the evaluation. 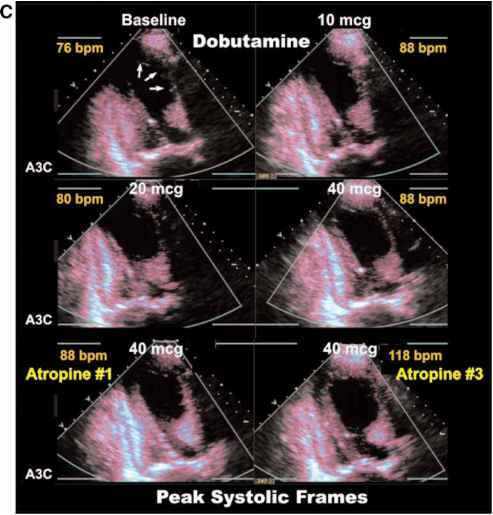 However, in regard to viability testing, dobutamine echocardiography is primarily utilized over exercise stress in the identification, localization, and extent of viable myocardium. 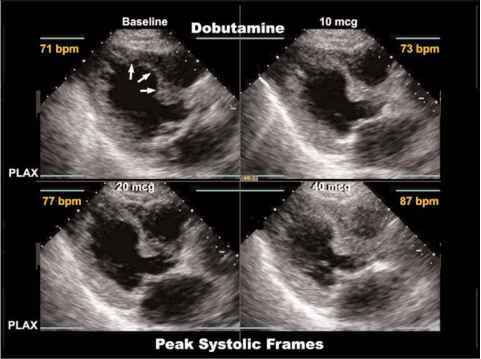 Dobutamine is the most commonly utilized pharmacological agent that is combined with echocardiography for the assessment of coronary artery disease. This cardiac inotrope provides stress through pi receptor stimulation and increasing myocardial oxygen consumption. Typically, dobutamine is infused in 3-5 min stages starting at low doses (5 ^g/kg/min) and increased until the maximal predicted heart rate is achieved or peak infusion levels are reached (40 ^g/kg/min) (Figs. 4 and 5). Additional intravenous injections of atropine may be used to augment the heart rate in some individuals whom higher heart rates are needed. At peak levels, it is not uncommon to observe a drop in systolic blood pressure, owing to the mild vasodilatory effects of dobutamine. In contrast to exercise stress, this drop is not specific for severe coronary ischemia. Echocardiography images are obtained in the same views as treadmill testing, i.e., the parasternal long, parasternal short, apical four-, and apical two-chamber views. Images are acquired at rest before infusion, low dose infusion (5 or 10 ^g/kg/min), peak infusion, and postinfusion. Images are displayed in quad-screen format (the four views mentioned previously on one screen) for each stage and routinely digitized for interpretation (Fig. 5; please see companion DVD for corresponding video). This protocol is often augmented when resting wall motion abnormalities are seen on the echocardiographic images. In this case, images are often acquired at both low dose levels (5 and 10 ^g/kg/min) to capture any changes in wall motion with low-dose infusion. As in nuclear stress testing, vasodilator stress has been used in combination with echocardiography. The agents typically used are dipyridamole or adenosine, both of which cause coronary vasodilation and perfusion mismatch with subsequent ischemia when significant stenoses are present. This approach has not been routinely applied in the United States, however, has been more extensively used in Europe. 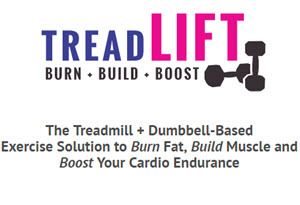 to pharmacological measures, and ensures the ability to achieve maximal heart rates. coronary artery (see Chapter 7, Figs. 3-5). However, there can be considerable overlap in perfusion territories and depends on coronary dominance, which should be taken into consideration when interpreting segments that may belong to more than one coronary distribution. More recently, a 17-segment model has been developed that takes into account the true apex (see Chapter 5, Fig. 10B). This model has neither been routinely used, nor made a significant change in interpretation of stress echocardiography images to date.